Remembering Captain William Davidson and Lieutenant Frank Brown, and how the Maury Island hoax of 1947 marked the first casualties related to ufology. Excerpts from The Report On Unidentified Flying Objects by Edward J. Ruppelt, 1956. Ruppelt changed the names of Kenneth Arnold, Ray Palmer (publisher of Amazing Stories and Fate magazine, and also the "harbor patrolmen," Harold Dahl and Fred Crisman. For clarity, I've inserted the true names in parentheses. For the Air Force the story started on July 31, 1947, when Lieutenant Frank Brown, an intelligence agent at Hamilton AFB, California, received a long-distance phone call. The caller was (Kenneth Arnold), who had met Brown when Brown investigated an earlier UFO sighting, and he had a hot lead on another UFO incident. He had just talked to two Tacoma Harbor patrolmen. One of them had seen six UFO's hover over his patrol boat and spew out chunks of odd metal. (Arnold) had some of the pieces of the metal. The story sounded good to Lieutenant Brown, so he reported it to his chief. 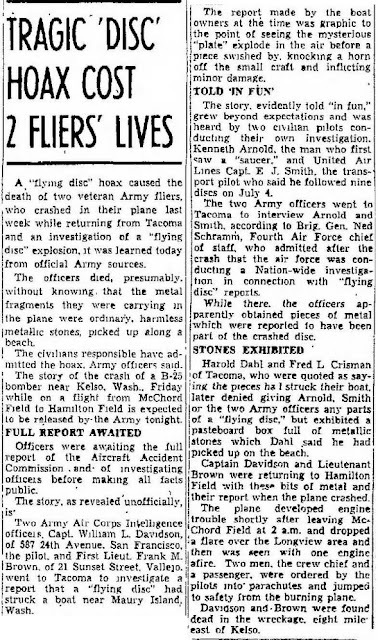 His chief OK'd a trip and within an hour Lieutenant Brown and Captain Davidson were flying to Tacoma in an Air Force B-25. When they arrived they met (Arnold) and an airline pilot friend of his in (Arnold's) hotel room. After the usual round of introductions (Arnold) told Brown and Davidson that he had received a letter from (Ray Palmer) a Chicago publisher asking him, (Arnold), to investigate this case. The publisher had paid him $200 and wanted an exclusive on the story, but things were getting too hot, (Arnold) wanted the military to take over. (Arnold) went on to say that he had heard about the experience off Maury Island but that he wanted Brown and Davidson to hear it firsthand. In June 1947, (Harold Dahl) said, his crew, his son, and the son's dog were on his patrol boat patrolling near Maury Island, an island in Puget Sound, about 3 miles from Tacoma. It was a gray day, with a solid cloud deck down at about 2,500 feet. Suddenly everyone on the boat noticed six "doughnut shaped" objects, just under the clouds, headed toward the boat. They came closer and closer, and when they were about 500 feet over the boat they stopped. One of the doughnut shaped objects seemed to be in trouble as the other five were hovering around it. They were close, and everybody got a good look. The UFO's were about 100 feet in diameter, with the "hole in the doughnut" being about 25 feet in diameter. They were a silver color and made absolutely no noise. Each object had large portholes around the edge. As the five UFO's circled the sixth, (Dahl) recalled, one of them came in and appeared to make contact with the disabled craft. The two objects maintained contact for a few minutes, then began to separate. While this was going on, (Dahl) was taking photos. Just as they began to separate, there was a dull "thud" and the next second the UFO began to spew out sheets of very light metal from the hole in the center. As these were fluttering to the water, the UFO began to throw out a harder, rocklike material. Some of it landed on the beach of Maury Island. (Dahl) took his crew and headed toward the beach of Maury Island, but not before the boat was damaged, his son's arm had been injured, and the dog killed. As they reached the island they looked up and saw that the UFO's were leaving the area at high speed. The harbor patrolman went on to tell how he scooped up several chunks of the metal from the beach and boarded the patrol boat. He tried to use his radio to summon aid, but for some unusual reason the interference was so bad he couldn't even call the three miles to his headquarters in Tacoma. 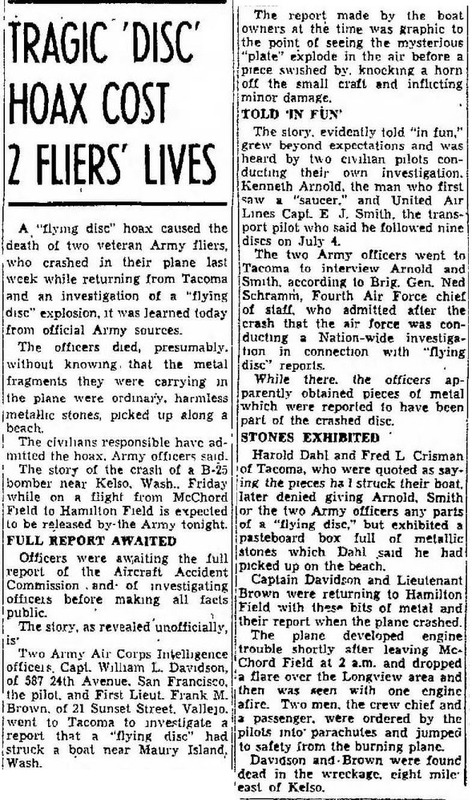 When they docked at Tacoma, (Dahl) got first aid for his son and then reported to his superior officer, Crisman, who, (Dahl) added to his story, didn't believe the tale. He didn't believe it until he went out to the island himself and saw the metal. (Dahl's) trouble wasn't over. The next morning a mysterious visitor told (Dahl) to forget what he'd seen. Then (Arnold) told about his brush with mysterious callers. He said that (Dahl) was not alone as far as mysterious callers were concerned, the Tacoma newspapers had been getting calls from an anonymous tipster telling exactly what was going on in (Arnold's) hotel room. This was a very curious situation because no one except (Arnold), the airline pilot, and the two harbor patrolmen knew what was taking place. The room had even been thoroughly searched for hidden microphones. After asking (Dahl) and Crisman a few questions, the two intelligence agents left, reluctant even to take any of the fragments. As some writers who have since written about this incident have said, Brown and Davidson seemed to be anxious to leave and afraid to touch the fragments of the UFO, as if they knew something more about them. The two officers went to McChord AFB, near Tacoma, where their B-25 was parked, held a conference with the intelligence officer at McChord, and took off for their home base, Hamilton. When they left McChord they had a good idea as to the identity of the UFO's. Fortunately they told the McChord intelligence officer what they had determined from their interview. The publisher (Ray Palmer), mentioned above, who, one of the two hoaxers said, wanted him to say that the rock fragments had come from a flying saucer, is the same one who paid (Arnold) $200 to investigate the case. The report goes on to explain more details of the incident. Neither one of the two men could ever produce the photos. They "misplaced" them, they said. One of them, I forget which, was the mysterious informer who called the newspapers to report the conversations that were going on in the hotel room. (Dahl) mysterious visitor didn't exist. Neither of the men was a harbor patrolman, they merely owned a couple of beat-up old boats that they used to salvage floating lumber from Puget Sound. The airplane crash was one of those unfortunate things. An engine caught on fire, burned off, and just before the two pilots could get out, the wing and tail tore off, making it impossible for them to escape. The two dead officers from Hamilton AFB smelled a hoax, accounting for their short interview and hesitancy in bothering to take the "fragments." They confirmed their convictions when they talked to the intelligence officer at McChord. It had already been established, through an informer, that the fragments were what Brown and Davidson thought, slag. The classified material on the B-25 was a file of reports the two officers offered to take back to Hamilton and had nothing to do with the Maury Island Mystery, or better, the Maury Island Hoax. (Arnold) and his airline pilot friend weren't told about the hoax for one reason. As soon as it was discovered that they had been "taken," thoroughly, and were not a party to the hoax, no one wanted to embarrass them. For further reading, see the case files in Project Blue Book on the Maury Island UFO hoax. For more coverage of historical UFO cases, see our companion blog, The Saucers That Time Forgot. A special thanks to Claude Falkstrom for locating the 1947 newspaper clippings. 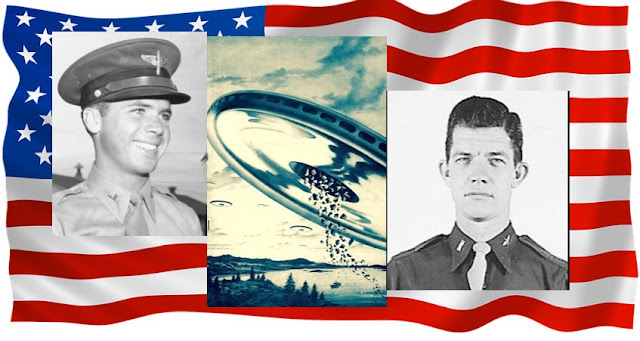 Thank you for publishing this piece and acknowledging the lives of the military's first, two UFO investigators, as well as their deaths in performance of their duty (investigating the then, Flying Disk phenomenon) on this Memorial Day. Many years ago, I tracked down the last surviving member of that ill-fated flight, former Sgt. Elmer L. Taft (now deceased) and interviewed him (via the phone). Although, wheel chair bound, and in poor physical health, he was as sharp as a tack as far as his mental faculties were concerned. In querying him about the flight back to Hamilton with Brown and Davidson and the subsequent crash, he recounted the events with remarkable clarity (the hair on my neck was standing up); so much so, I commented on it. He replied that not only was it the first time he parachuted out of a plane, but at the same time, he watched the men he was just talking to fall to their deaths, "it's a memory that I will take to the grave," he said. Taft was labeled a "hitchhiker" in the breaking news reports and I asked him to recount the story from the beginning; if memory serves he had been on TDY (temporary duty) and was heading to his home base in Oklahoma and would take a few flights to get there. I asked him about the "disk bits" (as labeled by the media) or UFO debris and to my surprise he said it was he who carried it on the plane. In sharing his thoughts about the material, he was unimpressed and stated that it appeared to be lava rock. One of the conspiracy theories as to why the plane went down is that the so-called UFO debris was the cause. This of course is pure hokum! The Mitchell B-25 was notorious for "leaky stacks"; specifically in that instance, oil seeped out and caught the left engine (I believe) on fire. After this crash, an order was issued to weld the stacks of every B-25 in the fleet. Taft credits Sgt. W.D. Mathews, the crew chief (and other survivor) for saving his life. He said that Mathews helped him put his parachute on, gave him quick instructions and pushed him out the hatch! What follows is the part of the anecdote that impacted me most; Taft recalled that as he floated down in his parachute, he saw Lt. Brown at the hatch, but he did not jump out. 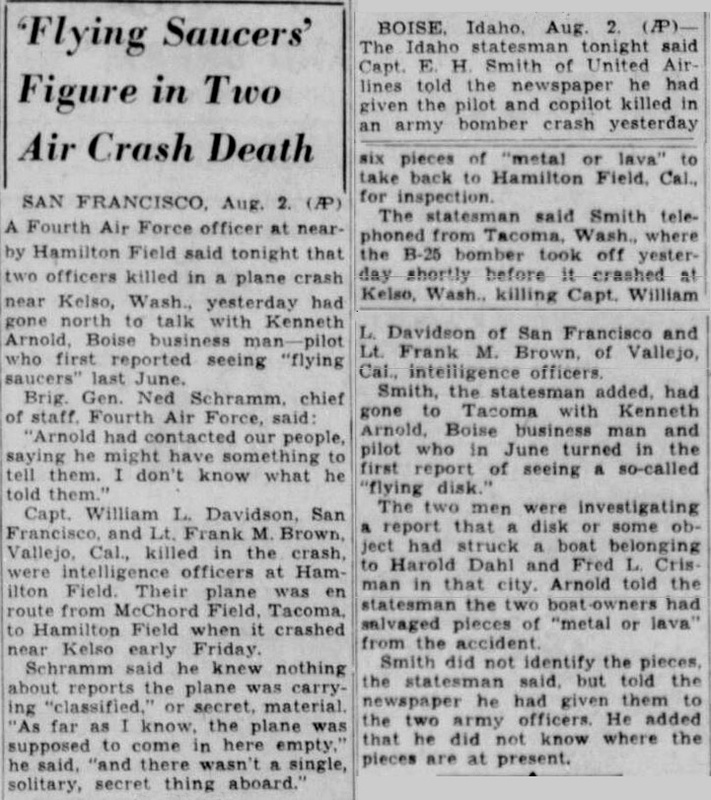 The plane did go into a spin, so it's possible that centrifugal force prevented him from jumping out of the plane; however, I would like to believe that he went back for his friend and colleague, Capt Davidson, to help him get out. When military investigators arrived, Brown was found about 500 ft from the wreckage, with his chute partially deployed; Davidson's body was still strapped into his seat with his feet on the rudder pedals. FYI: Their plane was to be part of a celebration (if you will) in acknowledging Air Force Day, i.e., the birth of the Air Force and separation from the Army. This is why they were in a rush to get back to Hamilton.